Royal Caribbean International customers are informed that Oasis of the Seas will not be sailing out of Port Canaveral on three dates in April after damage caused by a crane in the Bahamas. 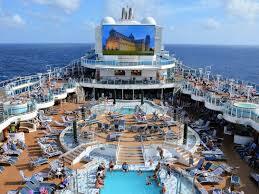 The sail dates for April 7, 14, and 21 have been cancelled, Royal Caribbean told to its customers. According to the officials of Royal Caribbean International have been assessing possible damage to the Oasis of the Seas, one of the world’s largest cruise ships, after a crane apparently slammed into the vessel as it sat in dry dock in Freeport Monday. The shipyard management reported eight people were injured when the massive crane struck the ship earlier this week, Royal Caribbean reported. None of the injuries were life-threatening, the cruise line said in a statement. The ship, which had been based at Port Canaveral, was undergoing routine maintenance on Grand Bahama Island, Royal Caribbean officials reported. The cruise line told customers anyone scheduled to go on the canceled trips will get a full refund, along with a 100 percent future cruise certificate to apply toward a different sail date. The excursions booked through Royal Caribbean also will be refunded. The Oasis of the Seas will return to the water May 5, sailing from Barcelona, according to Royal Caribbean. The ship made news earlier this year after more than 400 people contracted the norovirus, an infection sometimes referred to as the “stomach flu” that can cause diarrhea and vomiting.